Private Label Ammunition | Ammo & Bullet Mfg. Inc. Becoming an entrepreneur can be overwhelming. However, with enough determination and help from the right people, you can reap the satisfaction of seeing the fruits of your labor. If you are interested in running your own business, why not consider selling private label ammunition. Many agencies and shooting ranges are in need of ammo and bullets for training or active duty. As an entrepreneur, you can supply them with your private label ammunition. What Is Private Label Ammunition? Private label ammunition is a result of ammo manufacturers that supply to other companies. These companies then sell the private label ammo as their own brand. Entrepreneurs can arrange with the manufacturers to have their brand logo or name incorporated into the product. You can reap many benefits from selling private label ammunition. Pre-made supplies can save you from the hassle of production and allow you to focus your efforts on marketing your ammo and firearms. Below are the other advantages. When you have private label ammunition, you can have liberty when it comes to marketing. The sky is the limit for entrepreneurs who opt for private label ammo. Whether it’s branding or marketing, the possibilities are endless. Keeping in mind what your target market finds appealing, you can choose the design and color scheme for your private label ammunition accordingly. From the choice of packaging to advertising, you have full control. A seller’s ability to package their private label ammunition based on what their customers find appealing will help them make their ammo special. Your goal as an entrepreneur is to establish your brand and advertise your private label ammo as well. You can establish brand loyalty when you have private label ammunition. In today’s highly competitive market, it is important to offer something different from all the rest. Private label ammunition manufacturers give you the freedom to customize your ammo or bullets according to how you want to project your brand. They may load and package your ammunition to your exact, custom specifications. When people realize that your private label ammunition offers something that your competitors do not, chances are, they will choose your brand over the others. The key is to gain insights on what your target market wants in private label ammunition. That way, you can project your ammo based on what they seek. If they like the private label ammunition you sell, they are likely to recommend it to their families and friends. In effect, you will see an increase in your customer base and achieve brand loyalty. For more info on target marketing in the ammo industry read this: https://www.nytimes.com/2009/11/08/magazine/08fob-consumed-t.html. Companies that opt for private label ammunition can get a higher profit. Private label ammunition tends to have higher profit margins compared to the generic ones available on the market. Although it will cost you to have the manufacturer imprint your company logo and name on the private label ammunition, the payoff can be tremendous. Once you place your trademark on the private label ammunition, you can set it apart from its competitors effectively. Through marketing, you can show your target market what makes your ammo different from the rest. Compared to generic items that fail to project this image of uniqueness, your private label ammunition can appeal to people who can connect with the branding you established. With more people choosing your private label ammunition, your profits are sure to increase as well. Ammo and Bullet specializes in being the top manufacturer, creating outstanding private label ammunition for various companies. We strive to supply you with the highest quality bullets available in the industry. 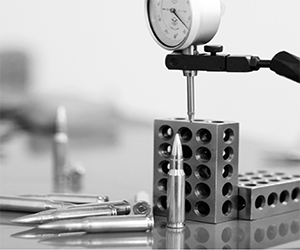 All the ammunition we produce is made from first-rate materials and using state-of-the-art equipment. Do you want to become competitive regionally? Get a head start on the competition and outsource private label ammunition from Ammo and Bullet. As your trusted ammunition manufacturer, we will handle all the production work for you. If you want to be our partner, contact us today! We use laser sensors to check powder levels. This process is done twice to ensure accuracy. Our company also uses optical micrometers to achieve satisfactory results for cartridge length, ammo seating, and case gauges. If we miss out on any step, we properly dispose of a cartridge. After the automated check, our ammunition is packaged. Technicians will examine possible defects before shipping our products. Our company also performs tests on random samples and checks component dimensions prior to loading. For our manual checks, we examine powder level, ammo seating depth, primer depth, and overall length, among others. Specializing in the production of high-quality ammunition for small arms, our business caters to private label, OEM, and contract manufacturers. We work with retailers who want their own line of ammunition. These groups of individuals can get in touch with us when they need help in developing products and meeting the demands of their respective businesses. The brave men and women in law enforcement face different challenges every day. We salute them for risking their lives to keep us safe. To perform well at their job, they should have reliable ammunition. At Ammo and Bullet, we develop ammo designed specifically for their needs, such as lead free ammunition for indoor training. Are you looking for the right ammunition maker? Look no further than Ammo and Bullet. Call us at (888) 407-0240 or fill out our contact form to place your orders and to learn more about our products. We are available from 9AM to 5PM. Partner with us, and we’ll help you get reliable ammunition.